Are white kitchen cabinets trending for 2019? Will white cabinets be popular in 2019? What cabinet colors are trending for new homes? White kitchen cabinetry is more popular than ever in trending new home colors for 2019. Bright white kitchen cabinetry continues to be the top choice for custom homes, with a variety of accents like this, with painted Linen cabinets, Absolute Black granite and white subway tile backsplash. This open island kitchen layout has white cabinets on perimeter with pale Morning Mist grey tone granite with slight lavender/purple vein. The island features custom Mountain Grey cabinetry with Ibere Maestra Black granite. The white and grey theme is picked up again with white subway tile backsplash and Blended Ice glass mosaic accent over cooktop area, and just a touch of deep grey on the walls. 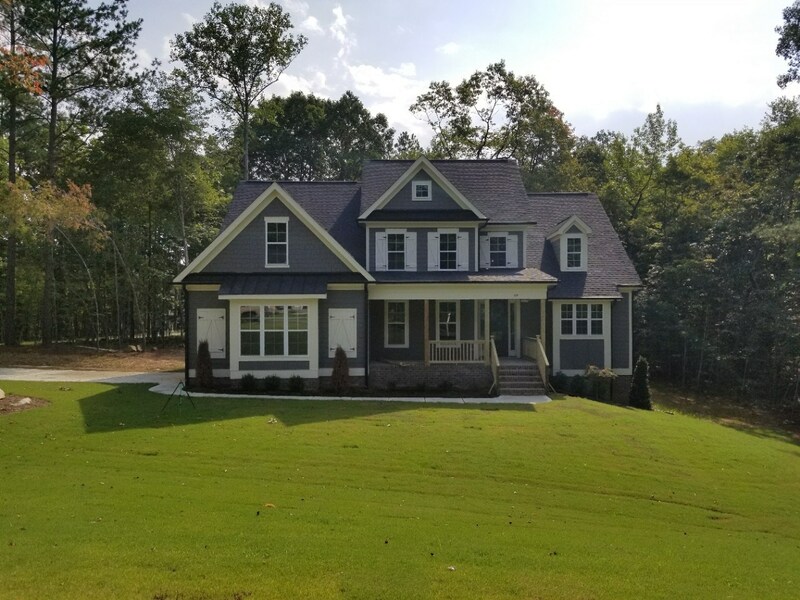 The classic layout in the Summerlyn lends itself perfectly to a combination of Cherry Java perimeter cabinets with Painted Linen with Hazelnut Glaze on island. 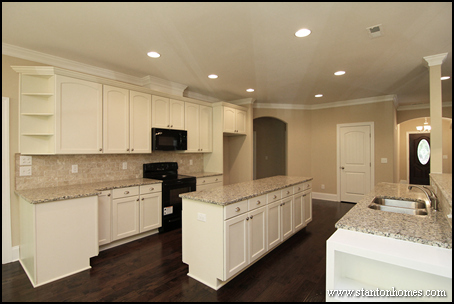 Each color is accented separately, with a Tahoe granite on perimeter with Suede Brown granite on island. 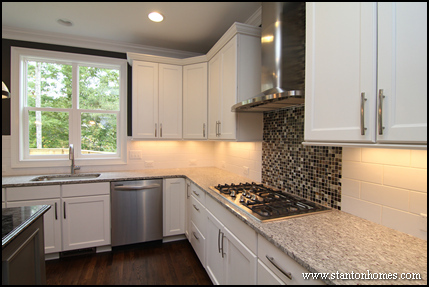 A beautiful natural tumbled stone backsplash completes the look. 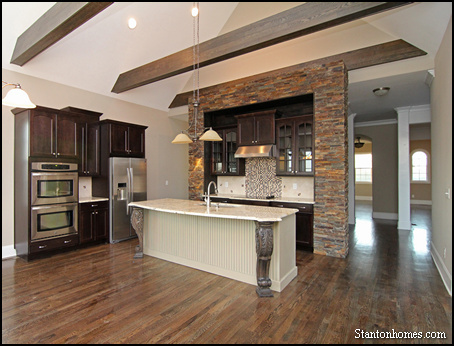 The stone accents and natural beams make the Country Manor kitchen a great place for entertaining. Perimeter is Espresso Maple cabinetry. 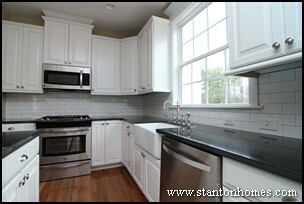 Island is painted Celadon with black glaze. Granite is Bianco Romano. Decorative stone veneer on floating soffit and framed columns framing kitchen cook top wall cabinetry. The dual island kitchen in the Cannon is bright, light and welcoming, with a combination of light and white. 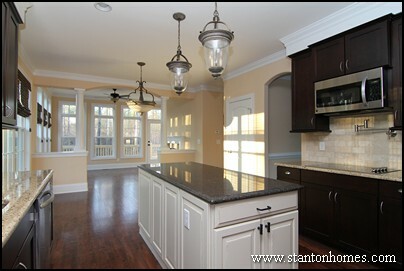 The cabinetry is maple with antique painted finish, topped with pristine Gran Dorado granite. 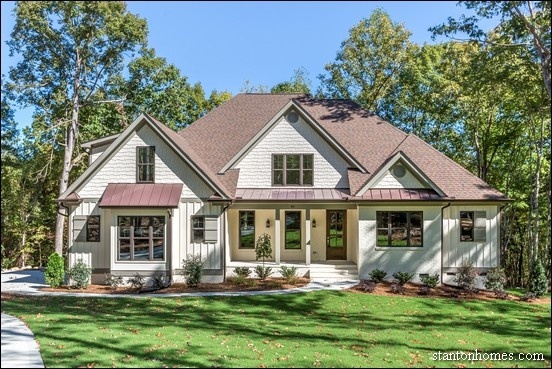 Rich Cherry tones contrast with brilliant glazed white cabinetry in the Brogan. 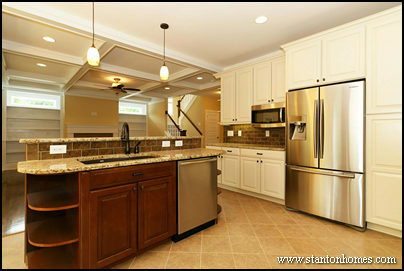 Cabinetry is painted maple with Butterscotch glaze, with Cherry Spice island, accented with a New Venetian Gold granite. 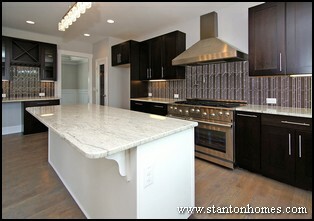 Maple perimeter is Espresso, island is White with Black Glaze topped with River White granite. Backsplash is Fudge Glass in a waterfall mosaic, with a vertical hang.